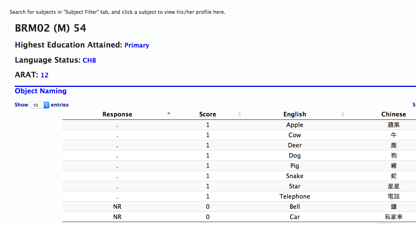 The Cantonese Aphasia Bank Database provides researchers and university educators access to behavioral data from Cantonese speakers with aphasia and healthy controls. This database represents years of linguistic, gestural, and prosodic data collection and analyses from healthy speakers of Cantonese Chinese as well as subjects with exhibited language deficits secondary to left hemisphere stroke. An account to use the Cantonese Aphasia Bank Database can be applied here. Eligibility of each application will be reviewed individually. Upon approval, the account will be valid for one year. The Cantonese Aphasia Bank Database was established by Dr. Anthony Pak Hin Kong (Department of Communication Sciences and Disorders at the University of Central Florida) and Dr. Sam-Po Law (Division of Speech and Hearing Sciences at the University of Hong Kong) with support from a grant of the National Institute of Health (NIH) “Toward a multi-modal and multi-level analysis of Chinese aphasic discourse” (R01DC010398). Other project contributors include Dr. Tan Lee (Department of Electronic Engineering at the Chinese University of Hong Kong), Ms. Christy Lai (Division of Speech and Hearing Sciences at the University of Hong Kong), Dr. Roxana Suk-Yee Fung (Department of Chinese and Bilingual Studies at the Hong Kong Polytechnic University), and Dr. Brian MacWhinney (Department of Psychology at Carnegie Mellon University). This corpus is part of a five-year project and is still on-going. The database will be periodically updated. The data should only be used to study how the ability to produce and understand language is affected by a neurological event like stroke or be used for educational purposes in training speech-language pathologists and/or related professionals. 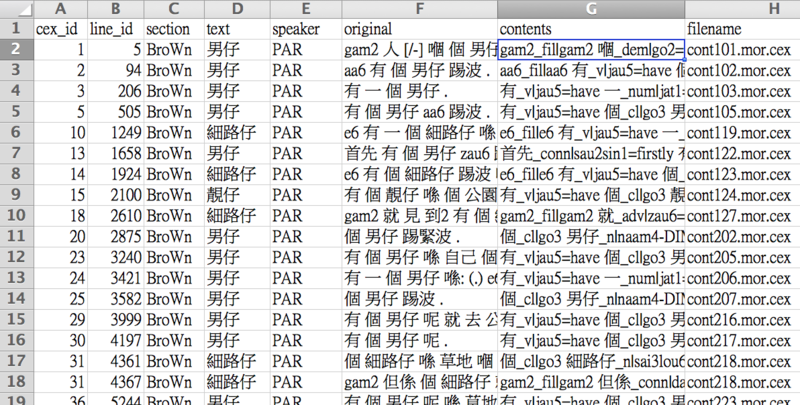 Users of the Cantonese Aphasia Bank Database should acknowledge that the database is proprietary to its developers. Contents of the database are copyrighted by its developers and all rights are reserved. Users shall not duplicate, distribute, sell, commercially exploit, create derivative works from, or otherwise make available the Cantonese Aphasia Bank Database or information contained therein, in any form or medium, to any third party. This Cantonese Aphasia databank will be strictly for educational purpose. You are not allowed to copy any materials from this website. If you do not have an account of Cantonese Aphasia Bank, please register here. The Cantonese Aphasia Bank database contains language samples from 149 normal native Cantonese speakers of different ages and education levels and 104 speakers with aphasia of different aphasia types. Participants are asked to describe pictures, tell stories, describe the procedure of making a ham and egg sandwich, narrate an important event in their life and recount their stroke experience (for speakers with aphasia only). Altogether, each normal participant provides eight speech samples and each participant with aphasia provides nine speech samples. All samples are both audio and videotaped. The recordings are orthographically transcribed. 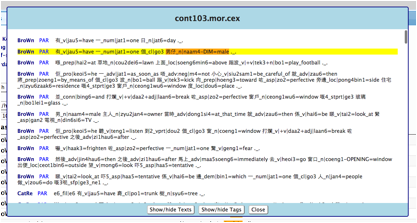 Transcriptions are formatted according to the Codes for the Human Analysis of Transcripts (CHAT). In addition to orthographic transcription, each lexical entry demarcated by a space is annotated for part-of-speech (POS), with automatically generated phonetic transcription in Cantonese Romanization, and an English gloss. The POS tag set in the database has a total of 38 classes as listed in [List of POS tags]. The design of the database allows the user to perform searches through a variety of parameters, such as keywords, POS, Cantonese Romanization (Jyutping), or filter subject in terms of age, gender or education level. Digitized video recordings of telling stories, describing the procedure of making a ham and egg sandwich, and narrating an important event from 98 normal speakers and 96 speakers with aphasia are subjected to annotation of co-verbal gestures. These videos are linked and synchronized with each corresponding orthographic transcription using the EUDICO Linguistic ANnotator (ELAN). Subsequently, all co-verbal gestures appeared are independently annotated with reference to their forms and functions. The gesture tag set in the database has a total of 6 types and 8 functions as listed in [List of gesture annotations]. The Cantonese AphasiaBank search engine comprises the following tabs: “Subject Filter”, “Subject Profile”, “Search by Word”, “Word List”, and “Browse Videos”. The features and functionalities of these tabs are described here. A quick and simple search of lexical information can be performed using the “Search by Word” tab. The search can be performed based on a Chinese character, a specific Chinese lexicon, jyutping, transcription, glossary in English, etc. Several search criteria can be defined on this tab. To start with, you may type a simple Chinese keyword in the box “Search Keyword (Chinese). For example, you may search for the keyword “仔”, and leave other parameters unchanged. For “Starts with”, any lexical items starting with the keyword entered will be identified. “Contains” mode will search for any lexical items that contain the keyword entered. “Ends with”: any lexical items ending with the keyword entered will be identified. For example, choosing “Ends with” and entering “仔” as the keyword, results like Fig. 5 will be obtained, where all highlighted lexical items end with “仔”, like “男仔”, “細路仔”, etc. Other than the basic keyword search using different match modes (1.1), we can also define more search parameters to fine-tune the search action. This can be done by entering any string of Jyutping (A Cantonese Romanization scheme) or English here. These two search criteria are combined into one box for simplicity. It is also worth noting that both the above Search by Keyword and Search by Jyutping/English are effective at the same time. The same goes for the following search parameters. In other words, these search criteria are overlapping instead of independent parameters. The results are an intersection of all the search parameters rather than a union. The default is “Any POS”. We can vary the length of utterences to be displayed in the results by adjusting the concordance length parameter. Please note the number of characters around the search keyword is based on the tagged texts. The tagged raw texts can be examined by turning on the Tag Display. Likewise, the display of Chinese texts can be turned on or off, to let you focus on the tags as needed. The search results can be downloaded as an MS Excel worksheet so that you can process the results further more conveniently. A sample Excel file is as follows. cex_id: This is an ID given to each subject's file. If two results have the same cex_id, that means the results are found in the same subject's file. line_id: This is an ID given to each line, or sentence within the subject's file. If two results are found to have the same line_id, that means both results are found in the same sentence. speaker: This is usually PAR, indicating the participant in the course of the dialog. Another possibility is INV, for investigator. original: The original texts before tagging. The original concordance is highlighted, and the whole original transcribed file can be examined by scrolling forward or backward. In each search action, the list of target words can be examined in the Word List tab, such as the following case when the word “仔” is searched. More specifically, the columns in the results will include the word list containing keyword “仔” (“Text”), information about morphological tag of these words (“Morphological Tag”), and their corresponding frequency (“frequency”). All previous search actions will perform the search over all subjects in the database, i.e. both speakers with aphasia and control subjects. In case you want to narrow the scope of your search according to subjects based on specific subject groups, the “Subject Filter” tab comes into scene. The tab heading will also show the subject being examined. Clicking on the list, a pop up window will appear and the video will start playing. The video will be played on the left, while a moving window of transcriptions will be displayed on the right. The current sentences spoken by the subject in the video will be highlighted (in yellow), together with the annotation information of gestures employed by the speaker (highlighted in orange). In other words, the video, display of language transcriptions and gesture annotations are synchronized. The transcribed texts can also be clicked for the video to skip to that position approximately.